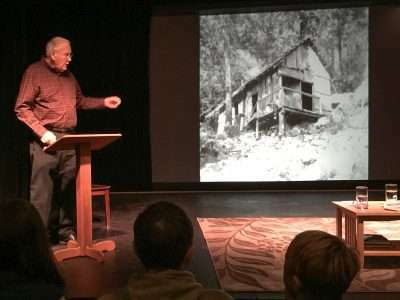 “It was a warm January in 1875, just like the one we’ve had, when John Muir visited the Middle Fork Feather River,” Will Lombardi told a packed house of over 100 people at the West End Theatre in Quincy on Feb. 12. Lombardi is an English professor at Feather River College who did his dissertation on Muir’s travels in the Feather River region from December 1874 through January 1875. Relying upon Muir’s actual field journals and historic topographic maps, Lombardi was one of two speakers featured at the community talk on “The Feather River: Yesterday, Today and Tomorrow” held as part of the fourth annual Sustainability Symposium. The symposium presented the event in its “Wild Words” series that is sponsored by FRC, Friends of Plumas Wilderness and the Little-Kittinger Foundation. “Muir depended upon the knowledge of local miners about where to go and what to see,” Lombardi said, explaining his own adventures to retrace the hikes Muir took during his time in the Feather River region and to research the locations Muir referenced in his field journals and published works. Lombardi explained that Muir left Mt. Shasta during Christmas week 1874 and went to Marysville, then on to Brownsville. 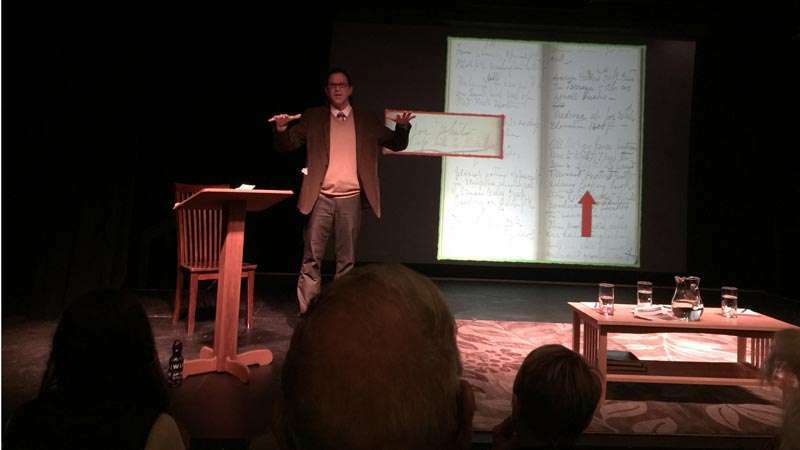 Relying on the journals of noted conservationist John Muir, published works and historic topographical maps of the Feather River region, FRC English instructor Will Lombardi delivered a fascinating talk about Muir’s travels in the area. The evening’s second featured speaker was author Richard Laursen, 88, who was raised on Milsap Bar and Crooked Bar on the Middle Fork during the 1930s and the Great Depression. Laughter and applause rang out in the packed theater where all the seats were filled and chairs had to be brought to line the side aisles. With slides showing the wild terrain that his family called home and the rough conditions where they spent a whole winter in a tent before moving into their first rustic cabin perched along the river, Laursen regaled the crowd with his attempts to navigate the river in a small car running over cable lines stretched across the banks. And he practiced balancing and rolling on logs. Sometimes, he fell in, which is how he learned to swim. Great Horned Owl got her), and how hard he worked to develop other boyhood skills. In 2004, Laursen published his memoir, “Life on the Middle Fork Feather River, 1937-1941 Plus.” The book details his life and times from ages 8 to 12 staying with his mother and stepfather on the river. Those formative years influenced his life. He went on to study wildlife biology at CSU Humboldt, then worked as a game warden and recreation planner for the State of California. 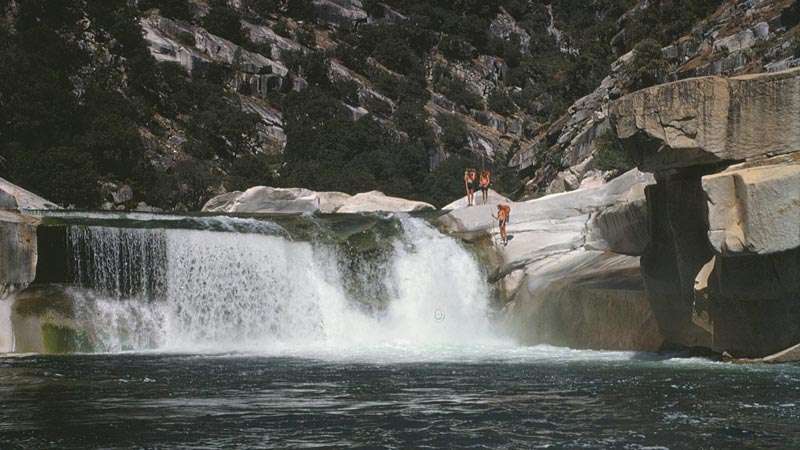 In 1967, Laursen and his friend, Brad Walker, hiked and swam 65 miles from Sloat to the Oroville Dam construction site. 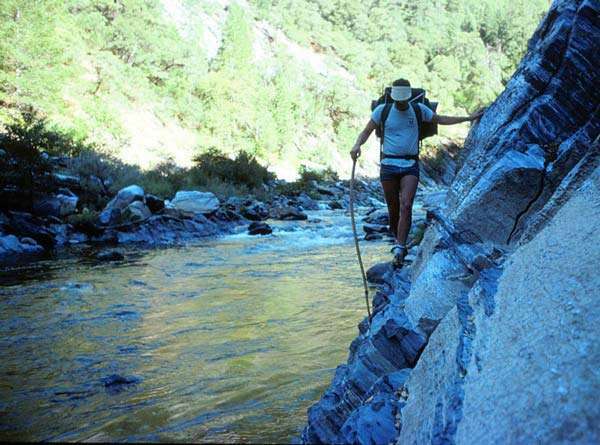 He took photographs and made journal entries to show that the Middle Fork was worthy of ‘Wild and Scenic River’ designation. Years later, he recreated the trip in 13 days with his own three sons (wearing tennis shoes) and the slideshow was filled with images of the boys navigating the majestic Feather River. 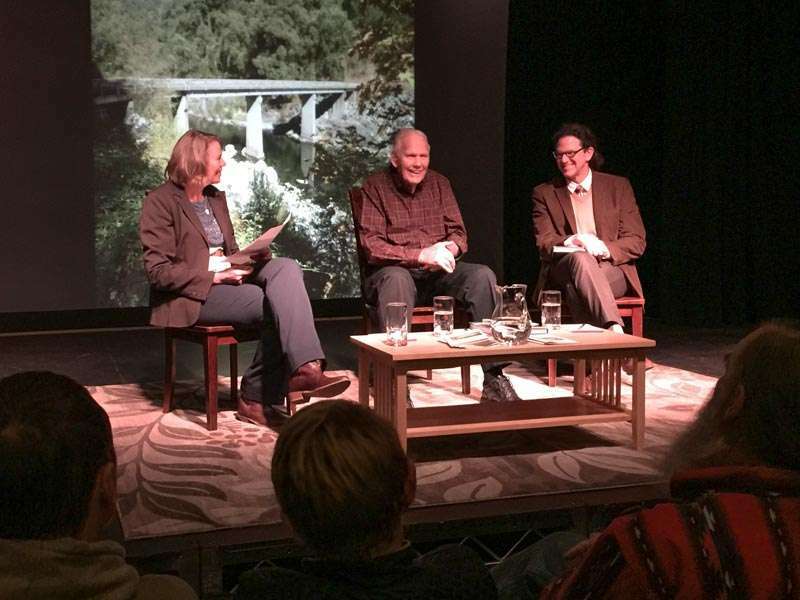 Feather River College Professor Darla DeRuiter, moderator of the evening’s presentations, sat down with Lombardi and Laursen at the close of the program to talk about the future of the Middle Fork Feather River and field questions from the audience. Together, the speakers talked about the health and well-being of the river, changes in habitat and fish stocks, temperature fluctuations of the water and diminishing presence of indicator species such as mayflies, stoneflies and caddisflies. They expressed concern that the strains of population growth and pollution can impact a resource such as the Feather and urged the audience to take a proactive approach to protecting wilderness treasures. Laursen said he was worried. DeRuiter reminded the audience that Friends of Plumas Wilderness will host its next event at 7 p.m. on March 19 at the West End Theatre with a presentation on the Bucks Lake Wilderness. Admission is free. She also encouraged the community to contact FPW with local stories about the Middle Fork and for information about environmental stewardship opportunities. For more information, visit plumaswilderness.org.